So much to love about this little book. 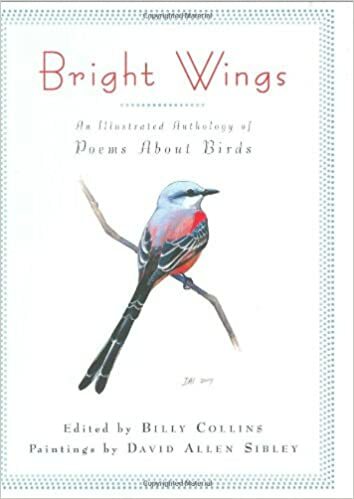 Poems collected by Billy Collins. (The man has good taste!) Illustrations by David Sibley. (Gorgeous.) Birds. Here's one of my favorites -- The Crows Start Demanding Royalties by Lucia Perillo. Christy has the bird-themed Poetry Friday Roundup at Wondering and Wandering. Oh. So much attitude! I'd not seen crows this way before - yet I recognise them! Happy Friday to the poets and birds alike! I want that book! Nice ending to the poem, and funny title, too. What a wonderful poem! I want that book, too! Delightful! Just delightful. Those crows hold so much personality...and have for centuries of poets. I love this! Oh my, this is marvelous, Mary Lee, how "they strategize for their class-action suit". I have another "On Wings of Song" but sadly, no "Demanding Royalties". Thanks! I always admire the cocky saunter of crows and think of them as pirates. Now I have a new image for them! I thoroughly enjoyed this poem and have added the book to my cart. Thanks! Mary Lee, I laughed when I read the 2nd stanza. My husband and I were just talking about Elvis when turned to the Elvis channel. Crows with Elvis hairdos-while I am not fond of the crow's look, I now have a new image that makes me smile. Oh, those crows do scream, don't they? I'm not a huge fan of crows, but Perillo's imaginings made me laugh! The blogger also has good taste! How perfect for today. The library has a copy of this and I am quite fond of it! It's a constant battle between those on staff who want to "de-accession" a book that doesn't go out frequently, and me, who wants to keep all the books of poetry. There are some books a library just has to keep, and Bright Wings is one! Oh my, those crows...and a whole book of bird poetry.